I just ate this for lunch and it was delish! My brother-in-law has tons of vegetables growing in his backyard and yesterday he gave me a huge zucchini. I cooked it up and threw on some feta and fresh lemon juice. Anything with cheese and/or lemon makes for a pretty good snack in my opinion. I ate this by itself, but you could easily serve it alongside chicken and rice or at a summer barbeque. There are no measurements because I have no idea how much I used. 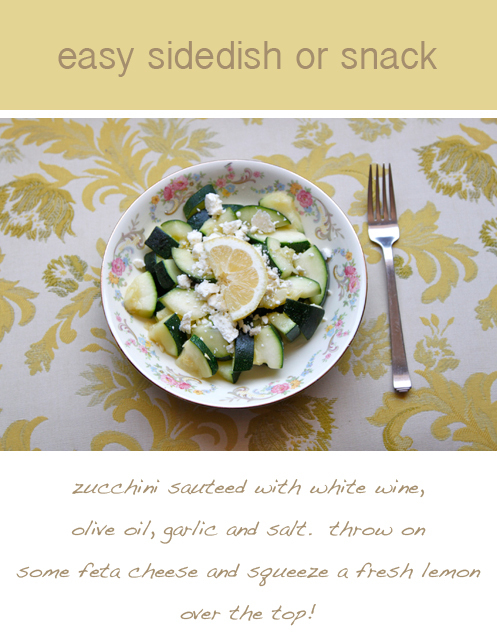 If I had to guess, I'd say a pound of zucchini, 1/4 cup leftover white wine (you can omit this if you don't have any), 1-2 tbsp of olive oil, 2 cloves of garlic or 2 tsp garlic powder, salt to taste. The feta is salty, so you can leave the salt out if you'd like, but I have a salt tooth, so I leave it in. You could also add fresh herbs if you have them on hand.